There is much more to designing a circuit board for taking current measurements than simply putting a sensor resistor at the power entry to the board. Particularly for a firmware driven product with wide dynamic current ranges, it is important to be able to isolate the current to the micro and different circuits in order to see the current draw of the micro and determine if the firmware’s power management code is working as expected. Below are several suggestions for designing boards for current measurements. The most important thing in designing your board to allow for current measurements is to isolate the power supply rail to the micro and any other high power circuitry like a wireless radio module using separate current sense resistors for each major circuit as show below. You will also want to be able to measure the current at the point of power entry to the board. Unless you are counting nanoamps, this is usually good enough and isolating the power to each individual circuit just makes the board layout more difficult. Current sense resistors should be placed on the power rails and not in the return path ground. Placing a resistor in the ground path may lead to ground bounce and increased noise in your circuits. If circuits are isolated as suggested above this would also lead to different ground potentials possibly causing erratic circuit behavior and even damaged ICs. If your board space allows for it, use a 4-pin “Berg” style header with the two center pins in parallel with a current sense resistor and the two outer pins grounded. This provides a clean way to connect a scope probe or one of the CMicrotek products. For normal operation you can jumper across the center two pins and then remove the jumper for taking current measurements. You can also use a jumper across the center two pins to prevent an excessive voltage drop across the sense resistor during a power-up current surge. After your development is completed it is easy to remove the jumper and current sense resistor in the board layout. If using a switching regulator in your design, a sense resistor should be placed after the regulator circuit inductor AND its bulk output capacitors, otherwise you can’t get a true picture of the current draw. If the sense resistor is placed on the input side of the regulator, the current waveform of the load circuit will be distorted by current pulses from the regulator. If the sense resistor is before the regulator input or between the regulator and the output caps you will miss the current flowing from the regulators output capacitors to the load circuit. If you can, it is a good idea to connect relevant digital signals to test points or even a test header in order to provide triggers and context to current waveforms. It can be very difficult to trigger a scope on the current waveform for a specific event, particularly if your product has more than a few power states. It can be even more difficult to determine what a circuit/firmware is doing based on just a current waveform. You may also consider using spare GPIO pins connected to test points to indicate certain events or conditions in the firmware. For instance, if you are using a wireless radio module and there are no digital signals that indicate when the radio is transmitting or receiving, using GPIOs so the firmware can provide these indications can be very helpful when trying to capture the current waveforms for those events. Setting GPIOs high/low can also be helpful when trying to determine the context of a waveform. Taking current measurements at the battery input to a board can be tricky, particularly when a voltage regulator or wireless radio is on the board. The main reason for this is the voltage drop most battery technologies exhibit as the depth of discharge increases (and to a lesser degree the voltage dropping as the load increases). A single cell lithium-ion battery may be at 4.2V when freshly charged but have a 3V cutoff voltage. 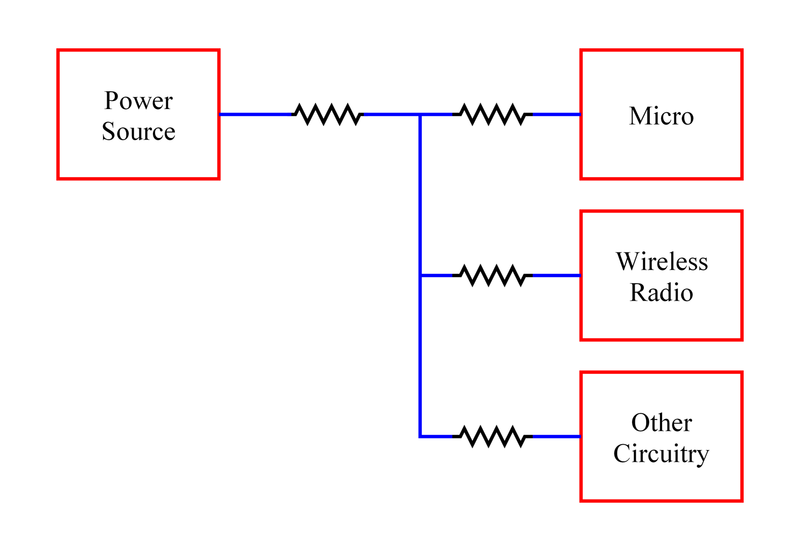 Since the voltage regulator or wireless radio requires a certain level of power, as the voltage decreases the current level must increase proportionally. A 100mW load at 4.2V will draw 23.8mA but when the voltage falls to 3V the current will increase to 33.3mA. To prevent confusion over these changing current levels, it’s a good idea to use an adjustable power supply in place of the battery so that you know if your current measurements change it is real and not caused by a change in battery voltage. If you must use a battery when taking current measurements, account for the voltage change by converting your measurements to watts to get more consistent results.